As you might expect, now that I’m settled on a plan for my pantry, breakfast room, and dining room, the wheels in my mind won’t stop turning. I’ve been thinking non-stop about colors, fabrics, furniture arrangements, lighting options, window treatment designs, and so much more. But one thing I’m really certain about is that I want some sort of banquette seating in the breakfast room, and preferably the built-in kind. I had a built-in banquette seat in the breakfast room at the condo, and I absolutely loved it. Not only did I think it looked pretty, but it was the most used seat in the house. I sat there every single day to eat meals, to work on my computer, to work on projects. It was perfect. Well, actually it wasn’t perfect. I said many times that my condo was my practice round before getting a house, and I learned quite a bit about what works and what doesn’t work about banquettes. 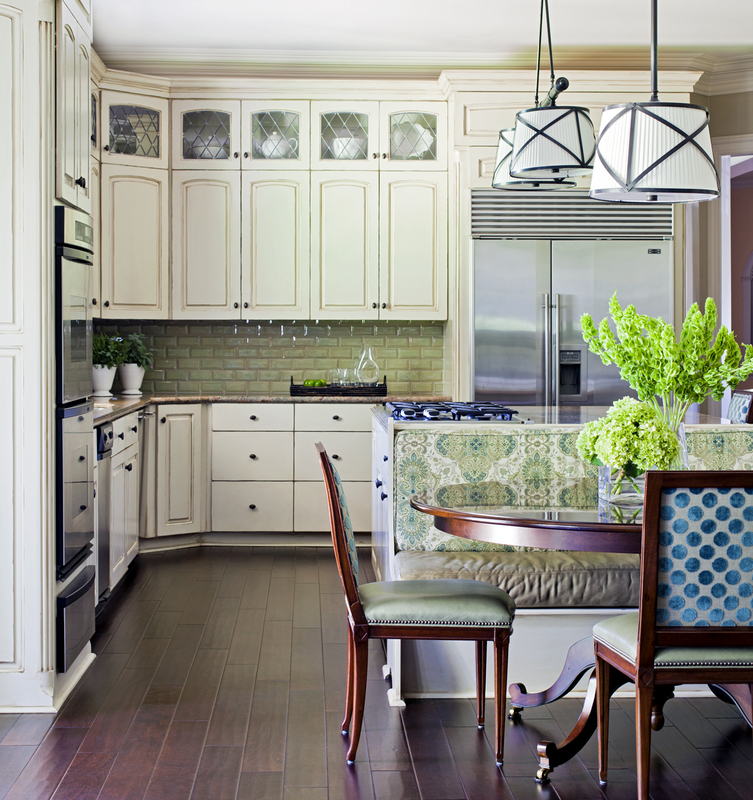 Those cabinets that I had on either side, while great for added storage, and of course, amazing for my symmetry-loving personality, really made it challenging to enter and exit the banquette, and it was impossible to do so without moving the table every single time. A round table would have made it easier, but then the banquette would have only been seating for one rather than two, and I would have had less work space as I sat there to work on things. So a banquette with nothing at the sides for easy entry and exit is a must in my book, whether it’s built-in or a separate piece of furniture. And also, while U-shaped banquettes are very pretty to look at, and make beautiful magazine pictures, I can’t imagine ever having one and finding it easy and convenient to use. It seems to me that in order to be able to scoot in and turn the corner easily, the table would have to be so far away from the side seats that the people seated in those areas would have to sit on the edge of the seat during a meal. Or if it’s close enough so that they don’t have to sit at the edge of the seat to eat, then it’s really too close to make maneuverability around the corner easy. So while I love the look of a U-shaped banquette, and it feeds my need for symmetry, I just don’t think I’d want one. After living for several years with a banquette with obstacles impeding easy entry and exit, this time I want one with absolutely no obstacles at all. My initial idea was to do a built-in banquette under the front windows, but my windows are so low that I would not be able to have an upholstered back on the banquette. At most, it would be more like a window seat with pillows along the back against the windows, similar to this. I think that’s very pretty, but if I’m going to use this banquette as much as I did the one at the condo (and I imagine that I will, and probably more), I’d like for it to have an upholstered back on it. Then I thought maybe I could use a banquette that’s a separate piece of furniture, rather than built in. 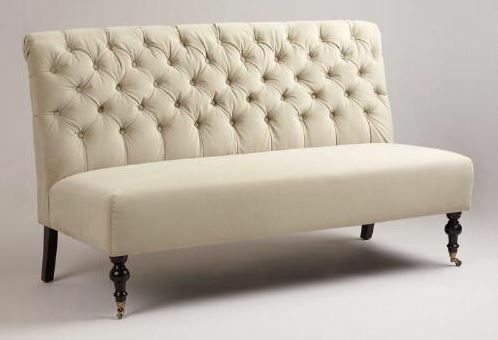 I found this beautiful Oyster Harper Banquette at World Market, and the price is amazing. I really can imagine beautiful draperies framing my windows, with that banquette seat centered in front of the windows. I think it would be beautiful. And quite honestly, if it were in stock online or at our local store, I probably would have already snatched it up. But it’s sold out online, and our local store doesn’t seem to carry it (or maybe it’s sold out there as well). Since I couldn’t impulsively purchase this banquette, I’ve had a little more time to consider it. If I just consider aesthetics, I think that banquette, and that arrangement (centered in front of the front wall of windows, with beautiful draperies framing the windows) would look stunning. From a practical point of view, I think it’s probably the worst option. The whole reason I want a really comfy banquette in there is because I foresee myself getting quite a bit of use out of that room, and not just for meals. I love that room because of the big wall of windows, and all of the natural sunlight, but the last thing I want is for my back to be against the windows all the time. I want to actually be able to look outside while I’m sitting in there. Plus, if I’m in there working at my laptop, the glare from the sunlight pouring through the windows would be very annoying. So that has led me to what I think my be my absolute favorite idea of all — incorporating a built-in banquette along the back side of the peninsula. 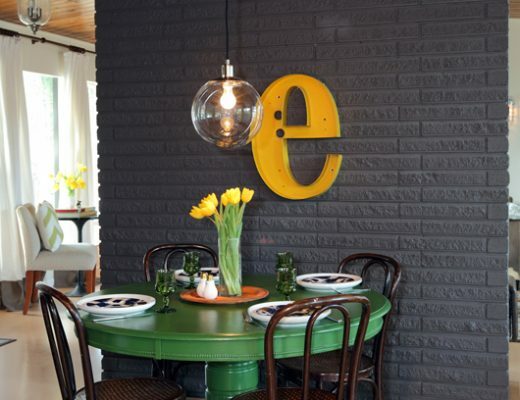 I’ve seen similar ideas all over Houzz and Pinterest, and I love the look. I really think it might be perfect for my room. That would mean that as I sit on the banquette, the wall of windows would be on my right side, and the TV I want to mount on the wall would be straight ahead. I’d be able to comfortably watch TV as I’m working at my computer or on a project in there. I could easily see out the windows as I’m sitting on the banquette. And I wouldn’t have to contend with glare on my computer screen like I would if my back is to the windows. At the moment, this idea is my favorite, but there are two things holding me back. I’d lose all of the storage on the back of the peninsula. The breakfast room side of the peninsula has three 3o-inch cabinets (12 inches deep) that are perfect for storing things like canned goods. So if I do a built-in banquette along the backside of the peninsula, I’d lose all of that storage. However, now that I’ve decided to turn the back end of the breakfast room into a huge walk-in pantry (about 12′ x 8′) that will probably provide me with all of the storage I’d ever need…plus some…I don’t think it would be a big deal at all to lose that storage on the peninsula. I would probably have to custom make a table to be the exact size I need so that the chandelier above the table can still be centered on the wall of windows. If I use the round table I bought a couple of months ago, any light hung above the table would be about six to ten inches off center on the windows, and that would drive me absolutely crazy. I’ve built several banquettes using above the fridge cupboards and setting them in a frame that brings them away from the wall for a comfortable sitting platform and by adding a toe kick made of 2X4s which I then cover with a matching veneer. Sew a cushion and pad the back at you are set! LOVE LOVE LOVE banquettes! Oooh, I love the direction this is going. It sounds so cozy and inviting! 1) What if you built the banquette as a separate piece of furniture as you suggested, but build the legs or platform so they can somehow hide a set of locking wheels? That way, you can use the cabinets to store stuff that’s not often used (think holiday items). When you need to get at them, you can unlock the wheels, roll the banquette out of the way, then roll it back. It also means you can easily put it elsewhere if you want a change of design. Another thought is to use the TV wall for the banquette instead. However, I don’t know where you’d put the TV where you could still see it from the table (short of the kitchen counter, which obviously not very desire able). A third thought is to maybe put the banquette in the middle of the room facing the windows as you might do with a couch in a seating arrangement and then put chairs against the window. It could have a sofa table or a shelf behind it as a drop area to hold things you pick-up or drop going in or out of the garage (keys, wallets, shopping lists, cell phones…). The only caveat that occurred to me with the middle of the room option for the banquette was restricting Matt’s access to the table. It depends on how big the table will be. This way you can center in the room. Oooh… I hadn’t thought of the Matt thing. Good call. Middle of the room would may restrict Matt like you said. My question is you said earlier that you and Matt like to watch TV during your meals. Would the banquette restrict his TV viewing? He wouldn’t be using it so where would you position his wheelchair for his TV viewing? I would put a big square on the wall for size & placement of TV then take Matt in and fiqure out where he would sit and go from there. I seem to remember that you don’t like swagged lights, but maybe you could do a light grouping? I agree the option to make the banquette mobile would be great. You already have the cabinets installed (right?) and it would be a shame to lose that extra storage. That’s an interesting idea! And yes, the cabinets are already in place. I had to have those installed before I poured the concrete countertop. I love the idea of it being on wheels and being movable! So do I! It’s sounds both practical and unique, and I love unique! Justin, that’s a stroke of brilliance. Our house is 100% hardwood floors with very few rugs (mostly because we haven’t really “decorated” and they’re pretty expensive). To save the floors from scratches and make it easier to move furniture around for cleaning or re-organizing a room, I’ve taken every piece of furniture in our house, ripped-out the nylon/plastic feet (a pair of pliers usually does the trick), and I replace them with those stick-on felt pads. Now, every piece of furniture (including the couch) moves around fairly easily, but not so easily that it slides when you sit down or put something on it. My only complaint is that the felt tends to trap wads of hair and lint (especially on the dining room chairs, which move around a lot). Probably would be even worse in a pet home. But it’s easily removed with your fingers or a vacuum. I have a loveseat-sized sofa instead of built-in (I rent in a retirement village), and a great table that is round when leaves are up and rectangular when leaves (they are short) are down. sofa is on those gliders you get so you can move furniture. Since it’s up against a wall, it doesn’t move, but could be slid forward to clean, etc. It’s so great to lounge on the sofa with my laptop, or sit upright with laptop on table. Best of both worlds! I know you’ll figure it out. I agree! What a great idea. Wheels would help to use the storage you so painstakingly built! And as for the TV. perhaps putting it on a wall/swivel will be enough for Matt to watch it comfortably and keep it on the wall opposite the cabinets. Sounds like a beautiful and very comfy idea! What about some sort of slide out storage behind the banquette, or have the upholstered back fold down to utilize the storage space behind? You can never have too much room for storage! We’ve got a straight banquette (with space on either side for entry/exit) planned for underneath the window in our kitchen plans and though it does mean we’re having to build a custom table to match it, but we’ll make that out of the same butcher block that we’re using for our counters, so I don’t think it’ll be too much extra work. Just curious, how deep are you planning on making your banquette? Would you suggest a little deeper if it won’t have a proper upholstered back and will just rely on throw pillows? I think standard depth is 18 to 20 inches, but I’ll need to verify that before I jump into this project. And then I think the standard allowance from the banquette back to the edge of the table is 18 inches. I would think you’d need less depth if you’re just doing pillows since pillows are squishier and give less resistance than an upholstered back. So if you lean back against a pillow, you’ll lean back further than you would on a solid upholstered back. Hope that makes sense. 🙂 But that’s also just my guess. I’ve always loved the idea of a banquet. When we were looking at houses a couple of years ago- several builders were incorporating them into their models at the peninsula similar to your last photo. Had we stayed in our old house I think it would have fit the eat in kitchen perfectly for space reasons. I love them. I probably would have incorporated one in our new house, but fell in love with a dining set first. As always, I look forward to what you actually come up with. I ditto… it’s harder than heck to spread out on a round table – everything seems to end up on the floor. I like the idea of the banquette in front of the peninsula! This will have an added advantage of disguising the discrepancy in the floor level there, and constructing it is such a way as to be able to move it out for seasonal storage sounds like a great idea too. Building a custom table on a pedestal base with slightly rounded corners on the tabletop would allow for easier access, and make room for Matt’s wheelchair to fit underneath also. Go for it, Kristi, I think it will be beautiful AND functional! Glad you nixed the u-shaped banquette option! I hate hate hate those things at restauants. They’re awkward and somehow make me feel enormous as I’m trying to get in to the back. Not what you want everyday in your home! 1) I like the idea of it on the back of the peninsula and with the pantry coming the loss of storage wouldn’t even be a blip on my radar. Build the banquette with storage in the seat for those used twice a year type things to recoup some of the loss if it really bothers you. My only thought is will the room look lopsided if the table is over on one side? I don’t have a good feel for the porportions so maybe not…but I’m imagining the table on the kitchen side with a bunch of empty floor and a TV on the wall for the garage side. I know you’ll make it look amazing. I would just want to make sure I’ve got a plan to balance it out. How about a console or buffet type piece of furniture on the tv wall to balance out proportion and give a key drop off spot too? My step-sister is giving me a beautiful buffet, so I might try it in there and see if it’ll fit. That is what I was wondering about too….space planning in the room. Maybe if you had a buffet in the garage wall…with great lamps etc? My step-sister is giving me a beautiful buffet, so that might be the perfect place for it. To balance things and keep your idea of the banquette against the peninsula why not use a rectangular table long enough to also put another banquet at the opposite end and center your light fixture like you want. You could then put a matching window seat under the window on that side and 2 chairs facing the window on the other side. I cant wait to see this room come together. When I was seated by the maitre d’ at a fancy restaurant’s banquet, he slid the table TOP so that I could easily get in. And, I’m sorry but it was over 40 years ago, so I don’t remember if the table top swiveled or if it slid away from the seating. But, as long as you will end up building a custom table anyway maybe you could incorporate something like that. I had never even thought about the possibility of just the table top being movable. What a great idea! Do a net search for the hardware needed to build a table top that is moveable. I recall seeing such a design recently but can’t out a finger on specifics. The wooden top is mounted on some kind of sliding frame thing I believe. Can you adjust those built in cabinet doors to make only the top half open. Lose the bottom part of the cabinet storage that will be behind the banquette seat. Inside the cabinet the bottom shelf will be at the same level as the seat of the banquette. Then build the back of the banquette so that it hinges to the seat part and can be folded forward to access the top-half cabinets behind the back. That way you lose only half your cabinet storage and still have a place for seldom used items. Kind of like the fold-up seat thing only in reverse. It makes a nice picture in my mind, but words don’t come so well to describe it. Trusting that you “get it”. Can’t you put the chandelier anywhere you want it since you haven’t done anything to the ceiling in there yet? Yes, theoretically, I can put it anywhere since we’ll have to run new wiring for it and install a junction box in the ceiling. But the options are limited when I consider my need for symmetry. 🙂 If the chandelier isn’t centered on the wall of windows, I know for a fact it’ll drive me crazy every single day. I wouldn’t worry too much about the storage, like others have mentioned, because of your pantry. If you don’t want to waste the potential storage space you already have though, you could use the base of the banquet for storage with a hinge on the bottom part, or you could put a hinge on the back part and have access to the actual cabinets you have there for less frequently used items. Absolutely love the Oliver Burns design. 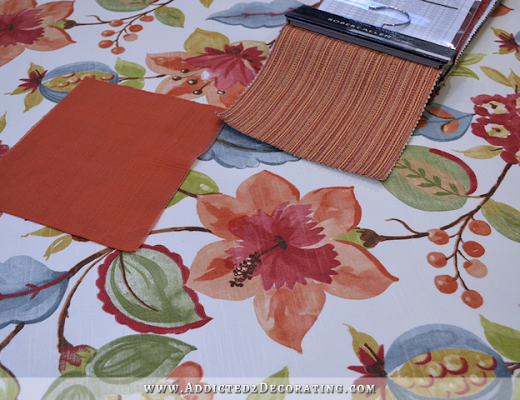 What will be happening in the rest of the room to balance out the banquette on one side? Are you still going to have an office to work in? 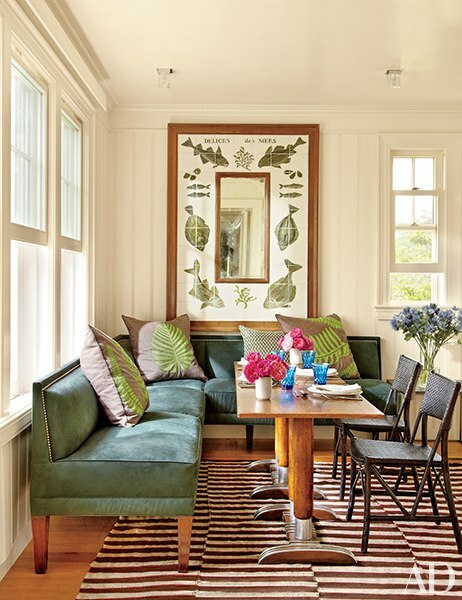 As several others have mentioned, the center of the room banquette seems like a unique and more symmetrically balanced option especially if an upholstered banquette similar the pic you posted from World Market were used (maybe not so high backed) with a couple of upholstered wing chairs on the opposite side….more like an efficient, work-friendly seating/eating area. This also allows (a) everything to be moved easily and (b)you can choose the placement to be able to view the wall mounted tv. Would this option be viewed straight through from the front doors (if fretwork barn-sliders open)? Would this option leave room for Matt to easily move around the room? I really haven’t figured out the rest of the room, so everything is still at the planning stages. I do need balance and symmetry, though, so I’ll need to have a definite plan before I start. I’m thinking of turning my office into more of a workroom with a huge table right in the middle (like the huge ones they have in professional drapery workrooms) with tons of storage underneath. If I do that, then I probably won’t also want a desk in there, since things will start to get pretty crowded with both. The breakfast room isn’t visible at all from the front door. One would have to be at the entrance to the kitchen (right now, the only one is from the music room ito the kitchen) or coming through the garage door in order to see the breakfast room. That sounds like an awesome plan for the “office”! Should have looked up your floor plan…sorry! I like the idea of a window seat/banquette with or without built ins. They you’d have room for 2-3 chairs and Matt could easily get his wheelchair in and out of the room. Your light fixture could be centered over the table for the symmetry you love. Hey babe! I say go with it! Your idea is fabulous!!!!! You’ll have more than enough storage in your new pantry…..and so you using that space won’t harm you in any way. The off centered window would make me insane as well…..not sure what the scenario is for you here…..but your BRILLIANT!!!! You’ll figure it out….and we’ll love the journey as usual! How about putting the banquette on the garage wall and putting the tv inside the peninsula storage area. You know it would be like those tv cabinets people put over their fireplace that have doors to hide the tv when not in use. It would be mounted on one of the wall mount tv brackets that would allow the tv to sort of “come out’ of the cabinet when yall are watching tv. That way you would already have plenty of cabinet space for movies and dvd player & all. That is if you wanted all of that with the tv. I would also have storage under the banquette seat. You may not ever need it, but the option with be there if you do need the storage. I don’t have any ideas about a hanging light, but if your banquette is on the garage wall how about two pretty wall mount lights behind it? Just my thoughts. Hmmm…that’s an interesting idea. My only thought is that then I wouldn’t be able to see the TV as I’m cooking or washing dishes at the sink. I don’t really know that that’s a big deal. We really do only watch TV when we eat meals, and then right before bed (on our laptops), so perhaps having it placed so that I can conveniently watch it while also cooking, cleaning the kitchen, etc., isn’t really a good idea anyway. I don’t really know that I need more TV in my life. Definitely something to think about! In your post, you seemed to have a heavy focus on using the space for your daily work…your laptop and whatnot on the table, being able to look out the window as you work, etc. You’ve also mentioned that you’re “TV at Mealtime” folks, and thus the focus on making sure you can see the TV from the table. Neither of those uses say, “Breakfast Room,” to me. In fact, they kind of more sound like a den or study in which you tend to also eat your meals. Also, I’m wondering if you’re assuming you’re going to want to use the space for work based on what you did in the condo when the two homes are really two different animals. Did you work at the kitchen table at the condo because you enjoyed the space or because you didn’t have a better or more comfortable option? I guess what I’m saying is, once the house is all done, are you really going to find yourself still choosing to work at the kitchen table, or might you find yourself migrating to a different, more appropriate or comfortable space that also has nice windows with a view? Maybe you shouldn’t be designing this space specifically for work. Just something to throw out there. At first I worked at the table in the condo out of necessity, but I also really loved having that spot to work. And as this breakfast room in the house will be one of only two rooms that will have a TV in it (the other being the family room, which is still a long way off), I do like the option of being able to sit there, work, and watch some TV. I’m also considering turning my office into more of a workroom/craft room, with a huge table right in the middle like they have in professional drapery workrooms. Right now when I make draperies, headboards, and other large items, I have to crawl around on the floor, and that’s getting really old. So if my office has a huge work table in the middle, I might not also want a desk in there. It might be too crowded for both. And I really am flexible about where I work on my computer, as long as I’m in a comfy chair. I do prefer a table or desk over working on a lap desk, so I don’t see myself gravitating to the family room in the future. Good things to think about, though! I love the work/craft room idea! Especially with the sewing and upholstery you do. I wish we had an extra room to do that in our house. Using the dining room table isn’t always convenient. There’s one other idea I thought of… There’s a restaurant near us that, instead of having tiny booths for tables of two, has tables with two wingback chairs. They’re neat because they give you that sort of private feeling that a booth does, but you can move them around to get closer and they’re a lot more comfortable than regular dining chairs. I know you’re planning to use wing-backs for the dining room, but what if you used them for the chairs opposite the banquette. If you did that, I wonder if they wouldn’t be comfortable enough to sit at to work and then you wouldn’t mind putting the banquette itself against the windows. Love that! I’ve always wanted a banquette but it won’t work in my space. As for your concern about losing the storage, it seems like you are pretty sure you will build some sort of pantry in there – even if you’re not 100% sure about the size/layout. 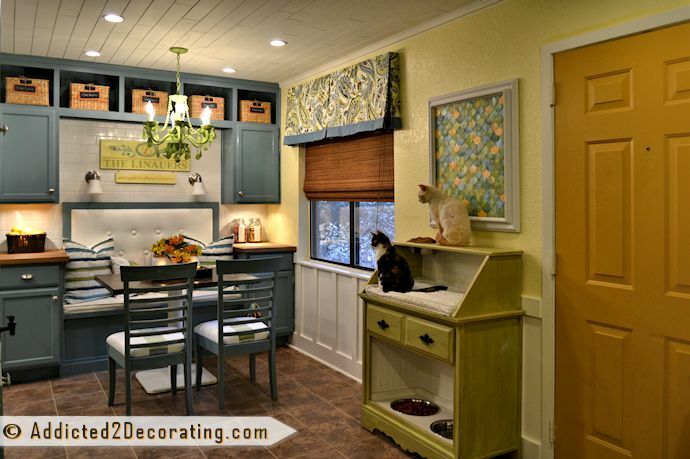 Also, you could always build pull out storage into the banquette. Obviously it would be too inconvenient for every day items like canned goods, but might be a good option for larger, one in a while items like food processor or over sized special occasion serving trays. Just a reminder: You are going to have an OFFICE from which to work.!!!!!! The banquette pictured with the stovetop behind it looks it must have been designed for someone who didn’t intend to cook in that kitchen! Either that, or the designer had no idea of how to combine form and function. That’s an accident waiting to happen. Just imagine the grease spatters on that nice upholstery! I’ve seen that same arrangement in another kitchen and couldn’t imagine why no one seemed to notice how impractical it was. I LOVE the idea of the banquet on the back of the peninsula! Good thinking!!! You have such talent! Your posts each day are so interesting and full and great ideas. I really miss it when you don’t make an entry!! I love the idea that of the banquette!! I too am glad you decided against the cabinets on each side. That would make it cramped and uncomfortable. 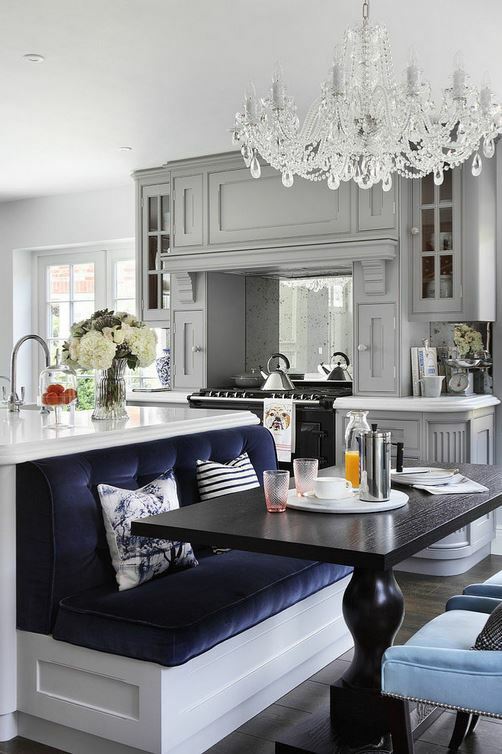 I like the idea of putting the banquette up against the kitchen peninsula but I can’t help but wonder if the splashes of water and good from the kitchen sink will be a problem. I know how messy the back splash of my sink gets. Just something to think about. Since you’re going down to studs again and you were talking about upgrading your windows why not have shorter windows if you want a build in under the windows. There’s no law saying you have to do all the house windows at the same time. As for your big worktable in your workroom, I would think there would be lots of times when you wouldn’t be working on really large projects as time goes by unless you take this up for a business at some point again. I was thinking could you make an end of your worktable hinged to lay back and reveal a lower desk area for you to sit at in a chair for all the times when you won’t be using the full worktable? Not that you won’t want to work on your computer in the breakfast area at times too. Its nice to move around a bit. I love the banquette idea, with comfortable furniture style seating and a tv in the room. That’s where I would hang out with my laptop! You will have plenty of storage in your newly planned pantry. We watch a little tv while eating our meals as well, so this makes complete sense to me. I also love your idea for a large craft style table in your office/craft room. Enjoy your time off, and keep those great ideas coming. I will look forward to your return and any projects large or small. Thanks for sharing your creative process with us all. 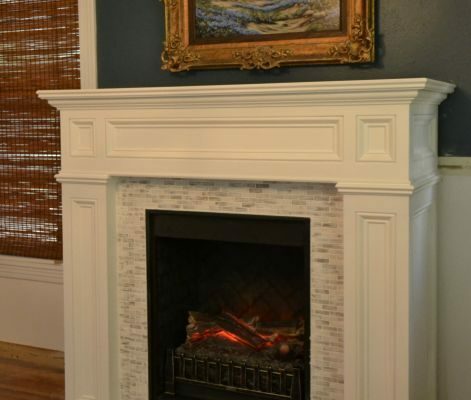 I was just wondering if there would be room to put in a fireplace across from the banquette? If you build one as you did in the livingroom…. It could be so cozy with the TV above! And it would let you fit another fireplace in. I doubt you and Matt would leave the breakfast room. LOL Just wondering but I cannot remember how wide the room is. I love the looks of the first photo. Pad the bookcase wall up past your head and sit there maybe. You can see outside and the TV. Leave window side unbacked to have the view unobstructed. That’s a lot of seating that you probably won’t use but it looks good and you’ll have it. Keeps your cabinets free plus it makes quite a statement. The ones against the island look too much like a diner to me. Just my opinion, whatever you do will be stunning, of course. I like the peninsula or island banquette but that stove right behind the seating in the last picture has me wondering what they were thinking. What a safety hazard and not to mention a potential mess should a guests hair sweep the top of the stove burners.